Small venues and touring acts need good sound, flexibility and a decent range of effects for whatever the demands of the gig might be. The l..
Small venues and touring acts need good sound, flexibility and a decent range of effects for whatever the demands of the gig might be. 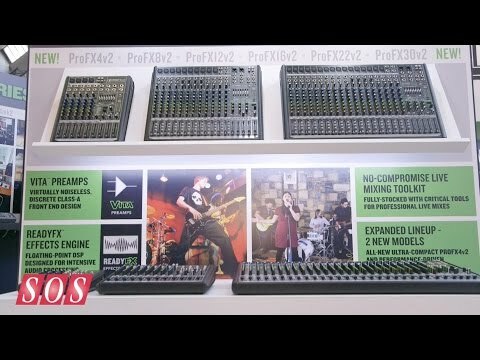 The latest Mackie ProFX mixers offer all these and the famous tank tough build. Every ProFXv2 mixer has newly designed Vita preamps that offer discrete topology to deliver classic recording studio console sound quality and ReadyFX built in to offer delay, reverb and modulation as needed. Includes USB audio in and out for recording a stereo bounce or playing back from a computer, there's even a full blown DAW included with Mackie Tracktion, making the ProFX a great tool for studio and live sound. All you need to get studio sound at any gig thanks to the 16 Vita mic pres, per channel compression and built in effects, the ProFXv2 raises the bar for Mackie's much loved "tank tough" mixing desks.